OWAIN TUDUR JONES today insisted the “smash and grab” win against Partick Thistle which lifted Hibs into joint fourth in the Scottish Premiership table was every bit as enjoyable as a five-goal triumph. Liam Craig’s sixth goal of the season stole the points for Pat Fenlon’s side, while goalkeeper Ben Williams answered his critics with a string of outstanding saves which paved the way to victory. Williams took the flak as the Easter Road club’s six-match unbeaten run was brought to an end by Inverness Caley Thistle, but he left the Jags shaking their heads in disbelief as he pulled off fantastic stops from Kris Doolan, Christie Elliott and Ross Forbes. While admitting he and his team-mates had probably got more than they deserved from last night’s clash at Firhill, midfielder Tudur Jones insisted the result simply helped make up for those early-season one-goal defeats by Motherwell and Hearts which heaped the pressure on Fenlon. The Welsh internationalist said: “Looking back on those games, we didn’t do a lot to win them, but we certainly did not feel we deserved to lose them. “Partick will feel hard done by. It was the game we expected from them. They pressed us, worked really hard and created some chances, and the fact big Ben gets man of the match kind of sums it up. 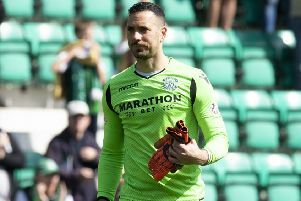 Tudur Jones believes Fenlon’s players are finally answering those critics who marked them down for another season of struggling at the foot of the table. He said: “If we sat down and listened to everyone, we’d be going a bit crazy and tearing our hair out. I can only speak for myself, I don’t read a lot or read too much into things either. “There was a hangover after the Malmo game, but the club has recovered really well. Last week in Inverness was probably the only time we have been well beaten, the only time we feel a team has fully deserved to nick the points off us. “Other than that we are on a nice run.” As tight as last night might have been, Tudur Jones insisted there was almost as much satisfaction to be derived from it than coasting to an easy win. He said: “As a professional football player when you are not playing particularly well and you come away with the points it’s all the more pleasing. “To get a battling three points is certainly just as good as winning 5-0. Every team strives to be doing well all the time. You want to be on your game playing pretty, attractive football.